No pain, no gain, right? Well, Jack Black believes the aches, pains and discomforts that come from a good workout should be short lived. Their Performance Remedy line of sports therapy skin care was created to soothe, heal, revitalize and replenish the parts of you that need a little tenderness after working and playing hard. As such, I decided to try out two of their products for myself. Chafing is a real problem for me, especially in the summer months when I take my workouts outdoors. So I was hopeful that Jack’s Dry Down Friction-Free Powder would live up to their chafe-free claims. And to my delight, it did just that! Dry Down keeps skin silky, smooth and dry for enhanced comfort and chafe-free workouts. The ultra-fine, talc-free formula quickly absorbs moisture to offer exceptional protection from friction and irritation, for refreshing comfort in the most demanding environments. The secret to Dry Down is four key ingredients – Pure Cornstarch, Organic Green Tea, Organic Cucumber, and Lavender. This might sound like some new-age hippie stuff, but it seriously works. If you’re looking for some southern comfort, pick up a canister of Dry Down today! 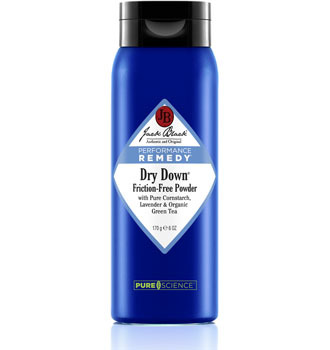 A 6oz canister of Dry Down retails for $19, and is available at Neiman Marcus, Nordstrom, Bloomingdale’s, Sephora.com, Saks Fifth Avenue, and at www.getjackblack.com. 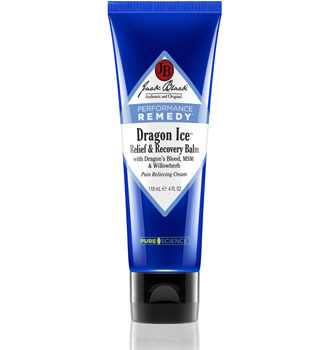 Dragon Ice Relief & Recovery Balm is the latest innovation in topical pain relief. A soothing balm, Dragon Ice penetrates deep to treat sore muscles and ease joint aches and strains, lessen discomfort from inflammation, and relieve tension. Dragon Ice can be used pre- and post-workout to enhance performance and speed recovery. Use it before your workout to warm-up overworked, achy muscles and to increase circulation. Use it after working out to treat existing aches and pains, and to restore newly worked muscle groups. You can even use it to relieve areas of tension and stress, like your neck and shoulders. This therapeutic balm offers an innovative formula enriched with invigorating Menthol to cool and soothe aches and pains, Organic Aloe to calm and soften the skin and Willowherb to combat inflammation. Dragon Ice also contains Dragon’s Blood, an anti-inflammatory, free radical scavenging, regenerating ingredient derived from the sap of an Amazonian tree, and restorative MSM to help soothe joint and muscle pain. A 4oz tube of Dragon Ice retails for $22, and is available at Neiman Marcus, Nordstrom, Bloomingdale’s, Sephora.com, Saks Fifth Avenue, and at www.getjackblack.com.